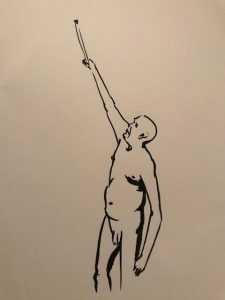 Gesture drawing: a noisy business? A couple of Thursdays ago I went to my first life drawing class at CSM. 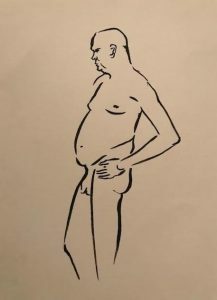 I had not been to a human figure life drawing class in years. 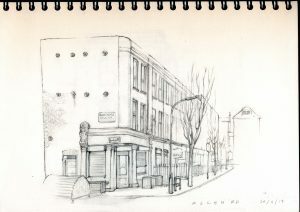 Sometimes I hang around my neighbourhood surrounded by the city noise drawing the urban landscape on my sketch pad. 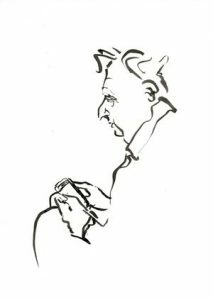 When I draw human figure it’s mostly on public transport. This is a man on the tube. I could not remember the last time I drew the human figure in a studio but probably not for a decade? But let’s go back to last week’s gestural drawing session. I remember entering a class crowded with students. Everyone had already taken their places as I looked for the last available seat. The model was already posing and everyone was silently at work. At first I was struck by the model’s facial features, there was something child-like about his physiognomy that I could not quite capture on paper. 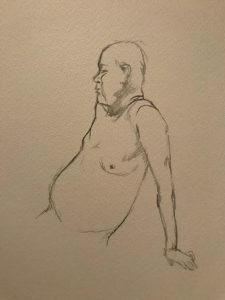 I was not meant to focus on details like the face since the purpose of this short posing exercise was to catch the subject’s basic form and the expression of movement. I admit that I obsess over details sometimes. 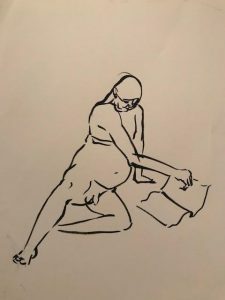 I recall thinking that the model had some of the longest limbs I’d ever seen and that his feet where just made to be drawn: so beautifully-shaped and sculptural! 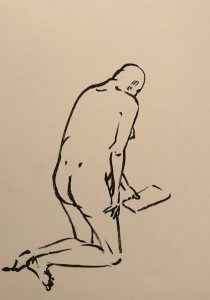 Below are few two minutes poses I drew with the brush pen. I was impressed by the lack of noise in the room. This made me realise what a loud person I am. At first I struggled with the silent environment. It might sound odd but the simple activity of sketching involves a lot of moving and fiddling around. 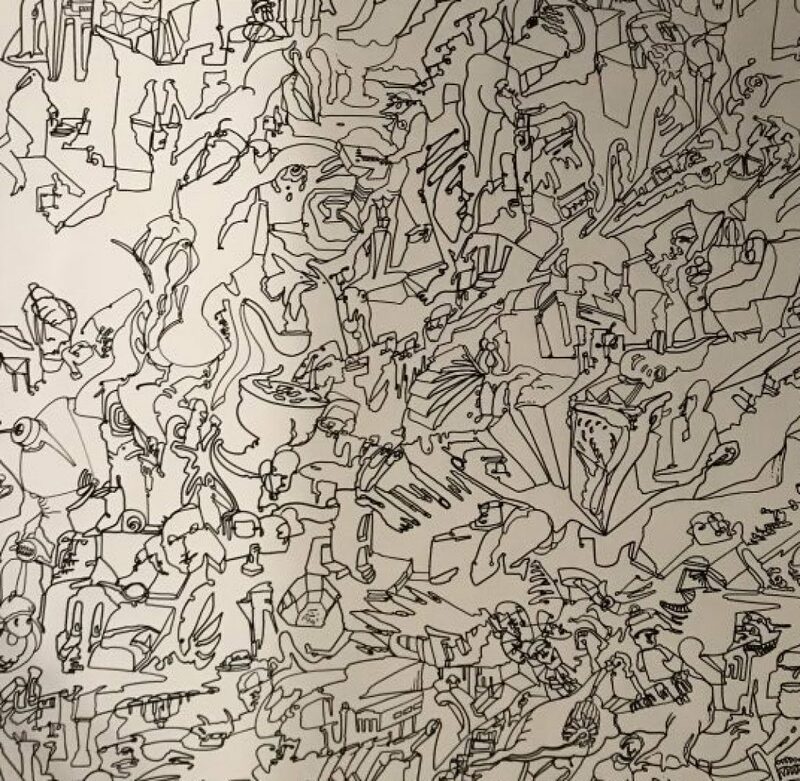 The movement from the upper limbs and head extends to the whole torso and therefore drawing can be quite noisy for some people. This month some of my work had been showcased in the exhibition “Dream’s that Money Can’t Buy” at Factory Grisu’ in Ferrara, Italy. 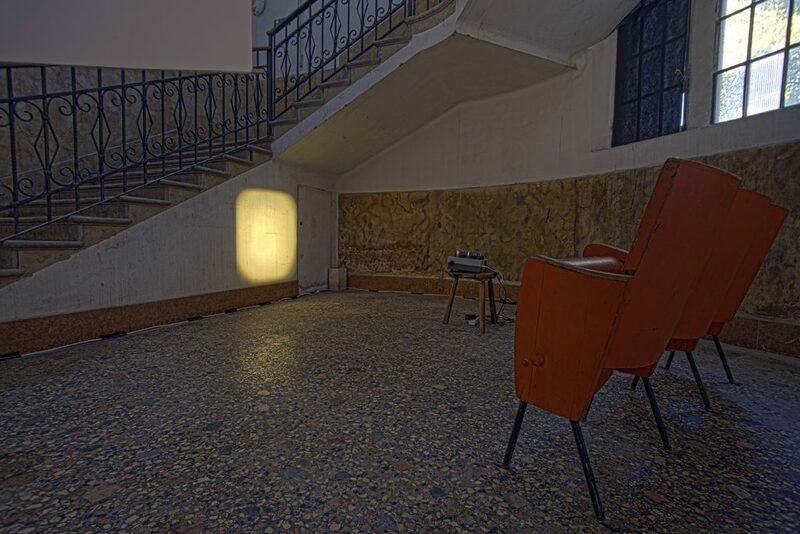 The show was curated by Sara Ricci in partnership with Cellar Contemporary and Ferrara City Council. The curator invited us to reflect on the 1947 experimental feature colour film by the Dada-Surrealist Master Hans Richter “Dreams That Money Can’t Buy”. Each artist had to create a site specific installation for a different area of the building, an old 1910 fire brigade station. 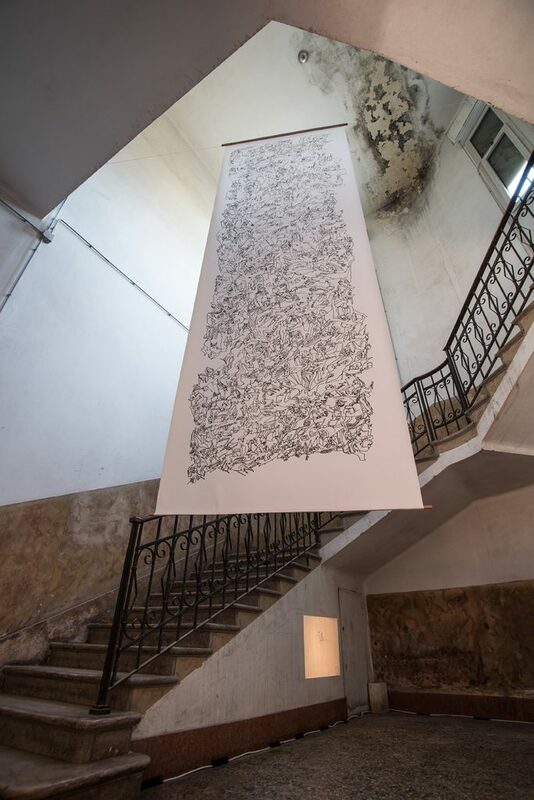 I chose the stairway space in the entrance to the building to hang my work; a continuous line drawing, which I refer to as an “automatic drawing”, drawn on a long scroll of paper. Automatic drawings form a significant part of my artistic production. It’s practice in which your mind is trying to suppress conscious control while shifting in between subconscious mental images. Dadaism and Surrealism both experimented the Psychic Automatism, which was the link between my works and the concept of the show. 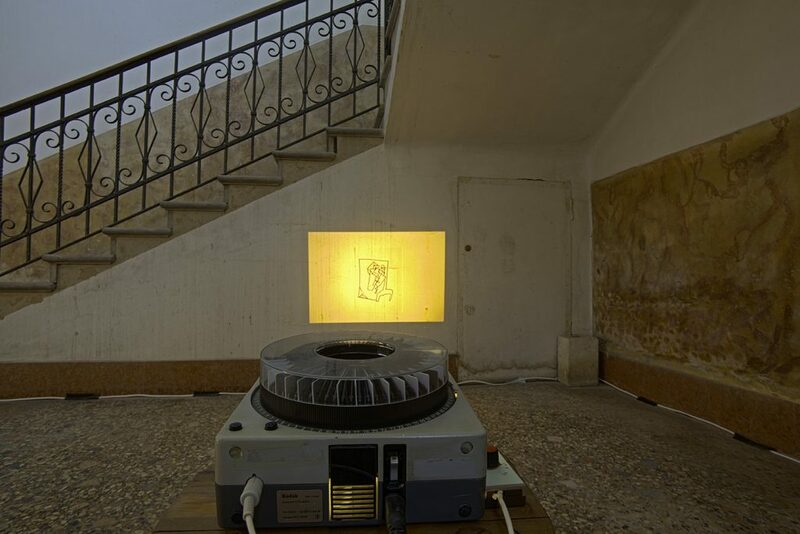 At the bottom of the stairs, I installed an old Kodak Karousel to project a selection of 42 A4 automatic drawings I’ve produced over the past year. 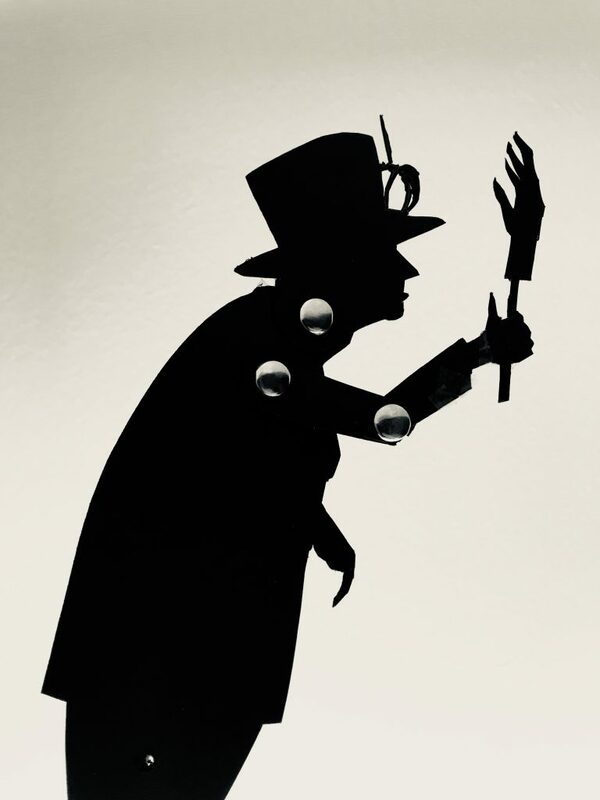 We had a shadow puppet project to carry out in four hours. It was our first group project and I am super happy with the result. I worked in tandem with my colleague Saffron on the design and cutting of the main character, the Queen. Once we got everything ready we had to start shooting. It was quite challenging to shoot the whole sequence in one take. The joke at the end about the queen waving a fake hand is a reference to a real event that Princess Anne reported to Robert Hardman, the author of the book The Queen of the World. 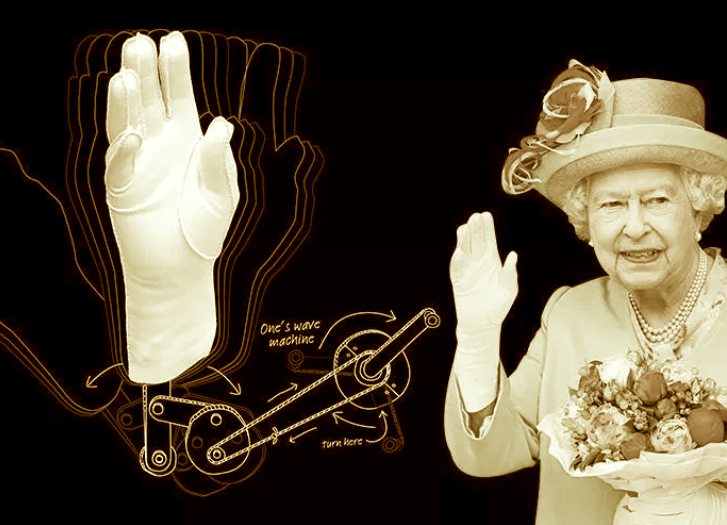 A fake hand-waving machine was given as a gag gift to Her Majesty by a group of Australian students. “That’s my first (animated) ball” is my first traditionally drawn animation, created after just a week at Central Saint Martin’s. It’s a bouncing ball that morphs into a little fatty buddha-like baby with antennae. The first part is made with the “key to key” technique which involves first drawing some “keys” or “key positions” and then adding “in between drawings” to complete the animation. It shows the ball bouncing twice before hitting an invisible wall, falling back on to the ground and rolling into the middle of the scene. The ball then suddenly becomes a little character who blinks its eyes before exploding to leave the scene empty. 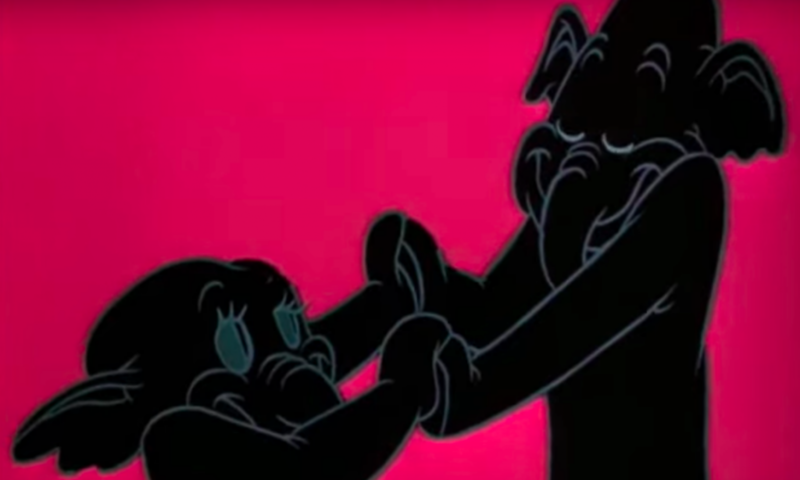 This second part of the animation was realised with a different technique called “straight ahead”: simply drawing one frame after the other. Although the clip I created is only few seconds long, these two different techniques have produced quite an effective animation. I built a talking Charles Dickens for the Bank of England!